This post is a continuation from my Virgin America Mileage Run. I was able to contact Virgin America prior to my flight to be put on the Main Cabin Select upgrade list. As Virgin America will no longer exist after mid 2018, there has not been an investment in integrating Virgin and Alaska elite status and benefits. As an MVP Gold 75K on Alaska flights I can upgrade to Premium Class at time of booking and First Class (if space) a few days prior to the flight for free. On Virgin America, you can get on a wait list for Main Cabin Select by contacting Virgin but the “upgrade” will only clear 24 hours prior to the flight. No free upgrades to First. Fortunately, I was upgraded to Main Cabin Select (MCS) on five out of 6 of my flights. There are a total of 12 MCS seats on the plane: Row 3 and Row 10. Row 3 is the first row after First Class. The way the planes are set up, there is a hard divider between First and Economy. Therefore, it feels like no one is ahead of you. There is a good amount of leg room, though you must store your bag in the overhead bin. The tray table slides out from the wall and is much larger and more solid than other Economy tray tables in other rows. Row 10 is an exit row with reclining seats. However the middle section of the A320 aircraft tends to be very warm. I found Row 3 to be far superior to Row 10. I sat in Row 3 for three of my flights and Row 10 for the two overnight flights. All the flights I where I was in Row 3 I had an empty seat next to me. Besides additional leg room, MCS seats give you access to unlimited free food and drinks. I loved this benefit. 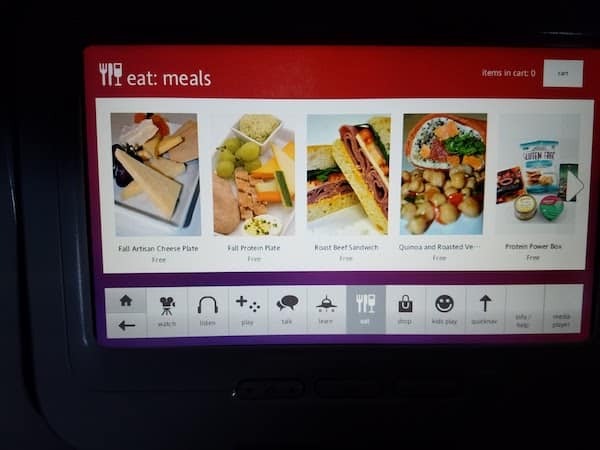 You just got on your IFE screen, ordered whatever you wanted, and it would be delivered to your seat. I found that a lot of the meal options ran out quickly. If I knew I wanted a specific meal, I would order it as soon as we hit 10,000 feet and the ordering system turned on. 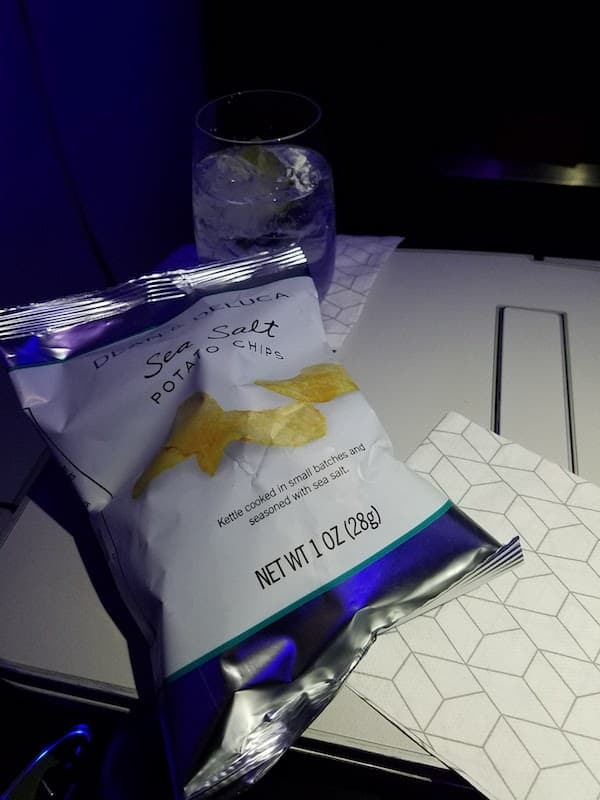 I think all flights had the three basic “boxed” meals (a protein box, the works, and a kids box) in addition to various snacks (cookies, popcorn, veggie chips). 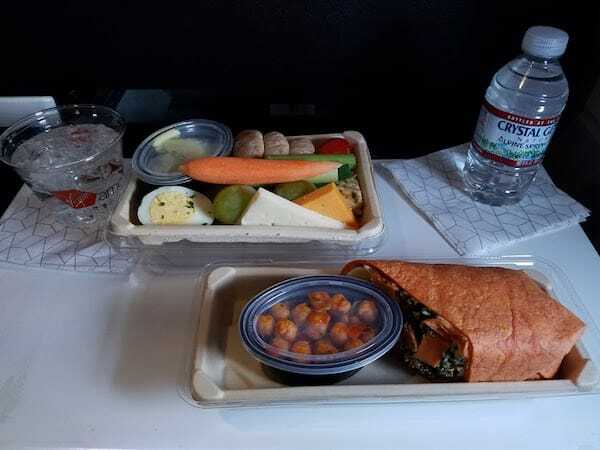 On the day time transcon flights, additional options included fruit and cheese plate, protein plate, quinoa wrap, salad, roast beef sandwich and PB&J sandwich. The overnight flights offered only a turkey sandwich and cheese plate. You can read more about food options here but note that it is outdated. I found the quinoa wrap and protein plate to be delicious. The boxed meals were fine but all prepackaged (nothing fresh). My final flight (SFO-PDX) I did not get a MCS upgrade. I had some money in my Travel Bank from a previous Virgin America flight, so I paid $99 to upgrade to First. Rumor is that the Travel Banks are going away prior to Virgin becoming Alaska, so figured I might as well spend it. It wasn’t worth it; there was no catering so the only food I got was a bag of chips. 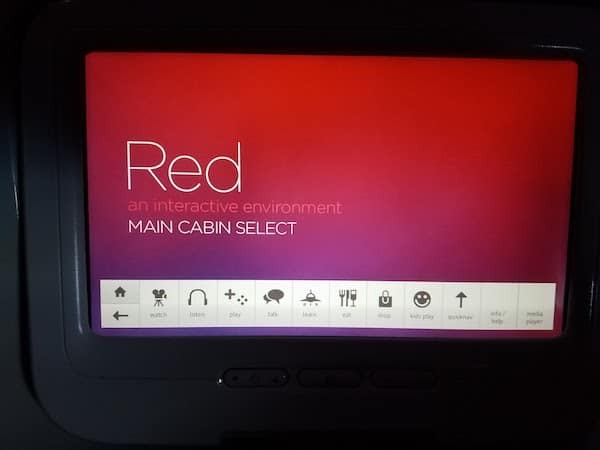 I will miss Main Cabin Select on Virgin America when the airline becomes Alaska. The free food and drinks and extra legroom are superior to the Alaska Airlines Premium Class. 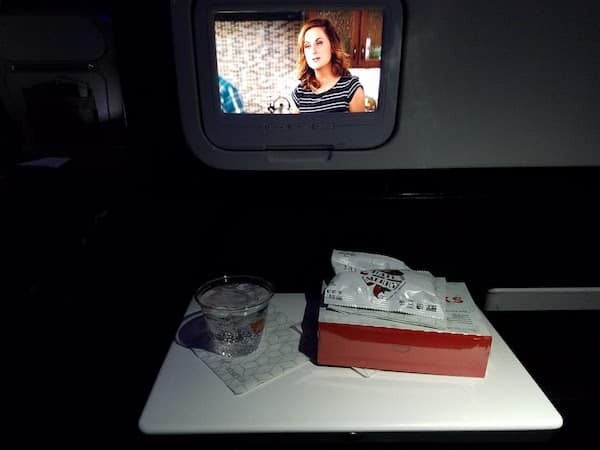 Have you flown Virgin America Main Cabin Select? What did you think?